There is no denying that Meal time is one of the most important aspects of any culture. Although traditions and materials have changed over the years, presentation is still one of the most important steps towards setting the mood for the evening. A warm, family atmosphere requires very different settings than a romantic evening for two. Whatever you’re eating, and whoever you’re eating it with, your plate set is a critical part of the setting, and nothing is more central than your plates. Dinnerware materials have evolved dramatically over time, and some fairly old materials are still in vogue today. Pottery and ceramics are still extremely popular, but pottery is also one of the chief things archaeologists look for in a new dig. Just as ancient pottery tells scientists about the society that developed it, your plate set tells your guests a lot about you. Melamine plates convey a casual atmosphere, and porcelain works for the most formal events. The pattern is a mode of expression, and plates feature designs inspired by everything from fine art to planets. Choosing can be difficult, even if you already know what material you’d like your dishes to be made from. We’re working to make that decision easier, starting with the most important part of any place setting, the plate. Whether or not you’re interested in a full plate set, everyone needs plates. We’ve gone through some of the most popular plate sets available and analyzed their value. Whether you’re looking for the perfect plates for a backyard cookout, or you want plates that you can use for a wedding reception, there is at least one set of plates on our list that will suit your needs. 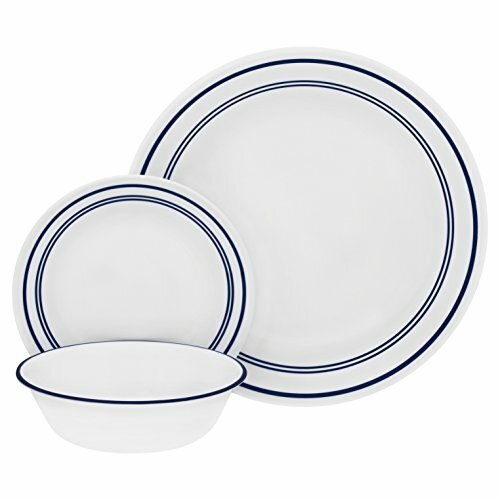 Below is our list of the best dinner plate sets. We chose products to review based on their popularity, so all options are accessible for the average consumer. They can all be purchased online, and some are also available in stores. If you’d like to know more about our review criteria and how we judged these products, check out our criteria for evaluation section below. We’ve also included a list of frequently asked questions at the end of this guide for your convenience. In each review, you’ll find a succinct list of features along with a more detailed description of the product. If you’re in a rush, you can skip to the pros and cons list, and if you’re especially interested in a particular product, be sure to check out our price/value assessment for each plate set. Please note that weights in this article vary. Some are per plate and some are per set. It’s easy to judge the difference between these two, however, because even the heaviest stoneware dinner plate doesn’t weigh ten pounds. Warm, inviting, and sturdy, these plates are fit for a private evening or a casual dinner party. These simple plates come in a set of four, making them perfect for the average family or a couples’ dinner party. They are dishwasher safe, so you don’t have to worry about spending a lot of time over the sink after your meal. If you need to keep a plate for a late family member, these plates can help. Not only are the safe for the washing machine, but they are also compatible with microwaves. The muted earth tones around the rim blend in well with most kitchens and aren’t so vivid they distract from your meal. For those who enjoy their dinner plates, additional dining ware in the same pattern is available. These plates sit at the lower end of the price spectrum, but they aren’t cheaply constructed. Stoneware is a sturdy material, but it is heavier than usual, so buyers should be careful how many they pick up at once. Drops are the primary cause of breaks. These dishes arrive well-packaged, and the chances of receiving broken dishes if they are ordered online are slim. All in all, these are a good value for their price, even if they aren’t necessarily suitable for all occasions. These unique, whimsical plates will add interest to any meal and are perfect for large dinner parties. 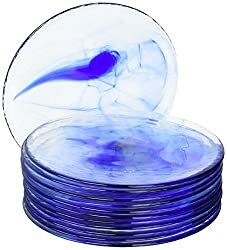 Designed to be made both socially and environmentally responsible, these tempered glass dishes are truly unique. The marbling process traces threads of blue through crystal clear plates in a minimalist design that will enhance the presentation of any dish. These dishes are made in Italy, where a time honored tradition of craftsmanship goes into every product. The plates are entirely recyclable and BPA free. They’re also sturdy enough to survive the dishwasher. If you enjoy your plates, you can purchase bowls, cups, and dessert plates in the same style. These dishes come at a very good price, and they arrive carefully packaged. Although they are made of glass, you will be surprised how hardy they are. They may actually be tougher than many types of fine china. The key problem is that these dishes do not arrive as they appeared. The dye is significantly less marbled than buyers might expect, and it occasionally pools in a single spot or makes strange patterns. Still, the price is very good. If you’re willing to try something new, these plates could be the perfect fit for your home. If you’re looking for simple, serviceable plates that will suit for everyday use, these will make an excellent addition to your cupboard. Designed for casual dining, these plates are sturdy and chip-resistant. They’re significantly thinner than the average dinner plates, so they’re incredibly good at saving space. Thin stripes around the edges provide a pleasant symmetry that matches essentially every kitchen décor scheme. Of course, these dishes are both dishwasher and microwave safe. Although they aren’t suited to formal dining, they’re great for family dinners and independent meals. These dishes may be simple, but they reflect that with a low price. Although there may be some stray ink dots on the occasional plate, they still feature a calm, soothing design. They’re space saving capacity is also a great blessing for families with small kitchens. Usually, these dishes come well and securely packaged. In the case one or two dishes arrive broken or chipped, you may have a hard time with customer service, which appears to be less than stellar. If you prefer minimally patterned dishes that can take a bit of day to day abuse, this is still a good investment. These vivid, engaging plates will get your day or your dinner party started right. Designed by Joyce Shelton, these pretty plates are great for festive dining. They may not match every kitchen’s décor, but they make a fun statement that your guests are sure to remember. Although they are dishwasher safe, the manufacturer recommends you place them in the top rack. They are also somewhat microwave safe. High fat foods and high temperatures could corrupt the plates’ elegant pattern. Although the manufacturer specializes in ceramic, they are actually melamine, and they are not listed as BPA free. Although they are not the cheapest set of plates on our list, they are still very affordable. They’re also a good alternative for party hosts looking to upgrade from disposable plates. It’s a shame they aren’t entirely dishwasher safe, of course, as not all dishwashers have eleven inches above the top rack. It also limits how many you can clean at a time. These factors negatively impact the dishes’ use for large gatherings. Since they aren’t BPA free, they’re also a debatable health risk. However, they are extremely sturdy. If the potential health risks don’t bother you, and you’re willing to take a little longer to clean up, these plates could still be a good investment. Vibrantly colored, deep, and sturdy, these plates are a classy setting for day to day use and dinner parties alike. These glazed stoneware plates keep in heat, so your food won’t go cold before it reaches the table. The manufacturer has a variety of colors in the same exact style, and they’re designed to complement each other, so mixing and matching is easy and fun. Naturally, they are both dishwasher and microwave safe. Clean up is easy, and it’s easy to heat up leftovers. The plates hold a lot of food thanks to their unique design, so you may very well have leftovers to reheat. Because they are a celebrity name brand product, these plates come at a slightly higher price than some comparable dishes. That said, stoneware is a very reliable material, and these dishes are built to last. The only complaint is that they are heavy and bulky, but that is simply the nature of stoneware. It’s that bulk that allows them to retain heat so well. 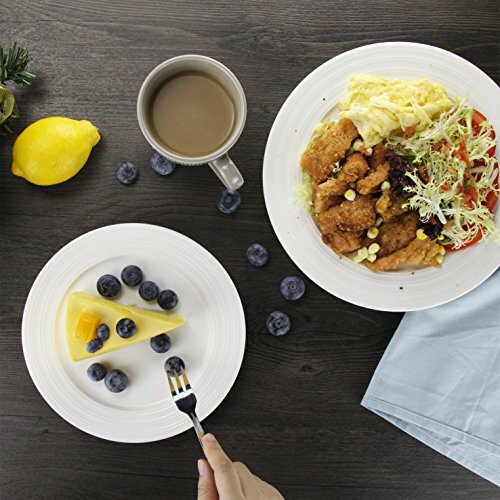 These plates are worth the slightly extra cost, especially if you’re a fan of Rachel Ray products, because these plates will match them very well. The ultimate in simple chic, these square plates will refinement and elegance to any meal. These plates are as simple as they are sophisticated. Porcelain is a classic for a reason. Porcelain plates are considered the best for formal dinners, but they also work great for casual and family affairs, too. Although they feature no print or dye, these perfectly white plates make plenty of a statement with their shape alone. They are dishwasher safe, which is always important, and they’re perfectly compatible with your microwave as well. Full matching dinner sets are available, so if you want, you can get bowls and mugs to match the exact white of your plates. Although porcelain plates aren’t as breakable as figurines and other delicate pieces, they do have a reputation for breakability. Since the manufacturer does not always adequately protect these plates when they ship, the products may arrive damaged. They are very affordable, however. You may spend in time what you save in price, but it’s still a good deal. These classic white dinner plates will bring a simple elegance to your table. They may be plain white, but the embossed rim on these dinner plates is just enough to enchant the eye. Fired in high heat, these plates are toxin free porcelain. Although they’re delicate, they are still suited to both your dishwasher and microwave. More than that, they are actually approved for your freezer and oven, too. Their tough glaze protects them from scratches and dents over time. Once you have your plates, if you enjoy them, you can get other dinnerware with matching embellishments. These plates are firmly mid range on the price scale. They’re highly breakable, but porcelain has been the classic dinnerware material for a very long time. Plates come securely packaged, and broken plates from online orders are fairly rare. These plates are resilient for a porcelain product, and they’re a reasonably sound investment, especially if you enjoy a more formal dining atmosphere. This set of plates takes a more relaxed, informal approach to the stylish square design, and they’re great for friendly entertaining and family meals. These lightweight plates combine stylish shapes, elegant patterns, and durability for a versatile dining experience. The plates are tough enough to actually come with a three year warranty. Once you’re done with your meal, you can toss the plates straight into the dishwasher, and they’re safe for microwaving leftovers. They are also oven safe. The designs will not scratch off, smear, or fade, no matter how you use the plates. 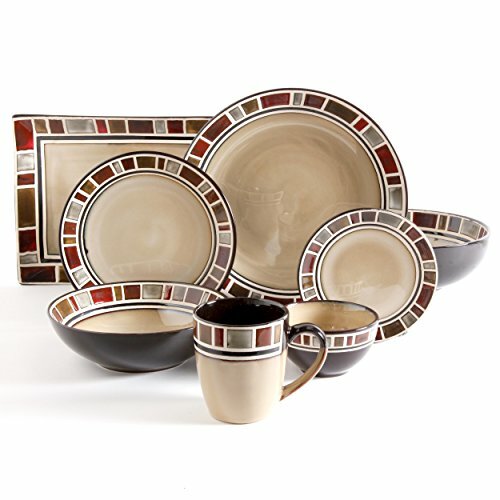 Full dinnerware sets, including glasses, is available in a matching pattern. These are great day to day dishes. While they may suit informal dining, these plates are really not designed to impress company. Instead, they make daily tasks, like storage and reheating foods drastically simpler. Since these plates are both light and sturdy, they’re very convenient for cleanup. They are very reasonably priced and sit toward the cheaper end of mid price products on our scale. If you’re looking for something practical that isn’t an eyesore, these are a fantastic option. These phenomenal novelty plates will wow guests and turn a casual lunch into an interstellar spectacle. These plates are all about looks. They bring the solar system to your table and spark all kinds of conversations. A product of the Unemployed Philosophers’ Guild, this set won the Museum Store Association’s Buyer’s Choice Award for 2014. They’re tough because they’re essentially made of plastic, which makes them a great choice for parties or outdoor dining on concrete patios and decks. They are dishwasher safe, but not approved for microwaves. Who wouldn’t want to bring the solar system to their table? These plates sell themselves on looks, and they really do look fantastic. Since each plate is a different planet, they’re great for breaking the ice at parties. They’ll give your guests something to remember. Of course, products that sell themselves on looks usually have a few skeletons in the closet. In this case, the plates are made from melamine, which is FDA approved, but has become one of those materials not all consumers can support in good conscience. The plates aren’t microwave safe, either, which somewhat limits their use. It comes down to what you want plates for. If you want a formal dinner, this is not the plate set for you. If you want something unique and fun for a casual affair, however, these are perfect. They cost a little more than average, but not much, and that’s to be expected when buying novelty products. Charmingly rustic without losing their formal elegance, these dinner plates are suited for most occasions. These plates feature just enough decoration to make them unique and appealing. Still, the teal pattern disappears into the background once dinner is served. These stoneware plates are tough enough for daily purposes, and they would make a great accent to a formal table setting. Since they aren’t porcelain, they may not be suited to a black tie dinner, but they are great for entertaining at home. The plates are both dishwasher and microwave safe. They’re even approved for the oven, and they can go straight from the oven to the table. If you’re looking for stoneware, these plates are a great choice. Unlike porcelain, stoneware evokes a more rustic ambience, and these plates play into that without going overboard. They have a very homey design that should blend in well with most kitchens, and they’re approved for all the things you subject plates to daily. We’re talking, of course, about the microwave and dishwasher. The fact that they can go in the oven is an extra incentive. Stoneware isn’t for everyone, but if it’s for you, these plates are worth your attention. They’re priced above the average, but they would be worth it to the right buyer. The best way to determine a product’s value is to analyze it by a pre-existing set of criteria. After all, manufacturer promises aren’t always reliable, and even if they were, every product is still slightly different. By using separate standards to compare products, you get the most accurate results. We considered the criteria below when developing our reviews. Since different sets of plates are made from different materials, this criterion became a little flexible. For example, you can’t fault a glass plate because it isn’t stoneware, and you can’t criticize stoneware for not being glass. We did, however, work with a clear bias towards porcelain simply because it is the only material considered entirely appropriate for any occasion. It’s a restaurant and catering standard that many people follow in their own homes. While we didn’t have any bone china in this list, that material has been out of fashion for a very long time, and it’s grossly impractical for the average buyer, anyway. Casual materials, such as glass, stoneware, and ceramic, were judged on their own, individual merits. Some materials have significant flaws that prevent users from enjoying them, however. The most notable example of this is stoneware’s weight. These dishes are very heavy, and customers would undoubtedly have trouble moving multiple stoneware plates full of food. Even moving a stack of stoneware plates up into a cupboard can be taxing. For this reason, we made a point to list the weight as a con. We understand that many people enjoy the weight of stoneware plates, but we targeted our reviews for the average customer. The only material to be singled as out as a flaw was melamine. This plastic material is tough, and it is FDA approved. However, a number of customers have concerns over the material’s potential toxicity, especially as it breaks down over time. It is important to note that melamine does not do well with microwaves. Even if a manufacturer says a melamine plate is microwave safe, you’re better off warming up food separately. Construction is especially important for plates, and it weighed heavily in the overall assessment. If plates had pretty patterns that smeared, that counted against them. The marbled glass plates also lost points for failing to actually provide marbled plates. After all, design flaws count as a construction problem, especially if they are consistent. Plates that arrived broken also lost points, because shipping is the manufacturer’s responsibility. Since the quality of shipping materials often reflects the manufacturer’s investment in their product, poor packing often coincides with cheap products. Although accidents do happen in transit, and plates are fragile, it’s pretty easy to spot substandard shipping materials when you open them. Exactly how careful do you have to be with your plate sets? If you’re more worried about protecting your plates than serving the food, the plates aren’t easy to use. Stoneware plates, in particular, take some tender loving care that counts against them. This is thanks to the different ways these plates are glazed and sealed. While a few perform just as well as glass or porcelain plates, sometimes the glaze and dye could be damaged by something as simple as bacon in the microwave. The fat content of your food shouldn’t damage your plates. Microwave and oven friendliness was a major ease of use consideration. These days, most people use their microwave at least once a day. Whether they’re warming up leftovers or reheating seconds for a guest, people are accustomed to the speed and ease of ‘nuking’ their food. If your plates aren’t safe for use in the microwave, they you have to dirty more dishes in order to warm up the food separately. Oven friendliness is great for warming dishes before a meal. Stoneware dishes do especially well in this category. Porcelain usually does pretty well, too. Melamine plates, of course, fail this part of ease of use entirely. The material a set of plates uses determines how well it meet a lot of these criteria from the outset. There are still, however, enough differences between manufacturers to demand careful attention. How well do these plates serve as plates? Plates have no moving parts or power cords, and they don’t do much besides sit on your table. Still, plates have their uses, and if they can’t reliably hold your food without being damaged, then they aren’t good at being plates. They’re also very poor plates if there’s a risk of being poisoned. Again, that’s why we treat melamine with a degree of suspicion. Running colors and flaking glaze are not the only symptoms of plates with low core performance values. If plates advertised as tough and difficult to break shatter by bumping into each other in the drying rack, then they have a low core performance value. Even if chips and cracks don’t compromise the integrity of the whole plate, they make plates inappropriate for hosting and formal dinners. Cracked edges can also cut very easily, especially in glass and porcelain plates, which is a safety hazard. Your plates should never dictate your meal. While we’ve mentioned this briefly above, plates that can be damaged by hot fat or other common foods desperately need redesigning. That speaks to the glaze’s instability. It also compromises the overall value of the plate by damaging its appearance. If you ever have to stop and wonder if a meal is safe to eat on your plates, then they have failed the core performance criterion. How well do your plates blend into your kitchen? Although safety is more important for core performance, it’s easy for plates to get bonus points through good design. Table settings have always been an artistic element of the home, and plates should reflect that. However, they shouldn’t steal the show. That right should be reserved for your meal or a centerpiece. Plates that compliment your kitchen’s decoration and design go a long way, and sometimes it’s the simple patterns that make the best dishes. Are your dishes dishwasher safe? Once upon a time, this might have been a luxury, but in the age of multitasking, it’s essential. Hand washing dishes, especially if you’ve just had a dinner party, takes a lot of time. A good host has other things to worry about, like entertaining the guests. The burden of dishes is an unnecessary stress that you really shouldn’t have to deal with. This is why it’s so important for your plates to go in the dishwasher. You may choose to wash a few delicate tea cups and antique pieces of serving ware, but your great big dinner plates need to go in the dishwasher. Plate sets that require hand washing lost essentially all maintenance points. A few sets, however, were only somewhat dishwasher safe. While it’s understandable for a printed mug or rubber spatula to go on the top rack, none of the plates we examined are small enough to fit in the top rack of the average dishwasher. This means that while the manufacturer’s sentiment was nice, top rack only dinner plates are essentially hand wash only plates. Such plate sets didn’t lose quite as many maintenance points, but they did not score very well, either. Q: What’s the big deal with Melamine? Like most manmade materials, especially those that can be considered plastics, melamine isn’t the most stable material on the planet. While it’s safe to eat off of in low temperatures, the problem comes when the material is heated. A recent study showed that even putting soup in a melamine bowl was enough to cause chemicals to leach into the foods. Test subjects who ate the soup had demonstrably higher concentrations of these chemicals in their systems. No one knows what long term exposure to melamine, or melamine ingestion does. Potentially, it could damage your kidneys and bladder. While there are no official side effects, studies are ongoing. Since humans once believed lead was a perfectly safe material for plate sets, it’s understandable why consumers are suspicious of dinnerware that leaks chemicals into their food. Q: What exactly is stoneware, anyway? The short answer is that stoneware is a particular type of ceramic. It isn’t fired at the same temperatures as more refined products, like porcelain. It’s also made with different materials. It’s typically thicker than other types of ceramics, too. Think of stoneware as a type of pottery, just like porcelain is a type of pottery. Stoneware dishes are characterized by their weight, durability, and thickness. It’s an important distinction that can tell you a lot about the product without having to dig through manufacturer claims and extensive feedback. While stoneware is more formal than many other materials, it still creates a rustic, slightly unrefined look. This makes it inappropriate for formal events. It’s perfect for casual dinner parties and family meals, however. Since it’s less breakable than porcelain, it can also stand up to significantly more day to day abuse. Q: How many plates should I look for in a set? This is a really good question, and it’s definitely something to consider before making a final purchase. The number of sets you purchase will depend on three things: daily needs, entertaining plans, and cultural standards. We’ll look at each individually. We’ll start in reverse, because what does culture have to do with dishes? If you’re a European American, you’re probably used to seeing basic dinner settings come in sets of four. This isn’t the universal norm, however. In Japan, things like plates are sold in sets of five. Guests may expect to be invited in these numbers, or multiples of these numbers if they come from similar backgrounds. While you may have trouble finding the exact number of plates you want, you can probably find a multiple of the number you need. For example, buying a set of ten plates is essentially two sets of five, which would be more acceptable than a set of four. Naturally, these concerns don’t impact everyone, but if you regularly entertain friends and family members that strongly identify with a particular culture, it’s polite to respect their traditions. Daily needs reflect the number of people in your home. If you live alone, then a small set of dishes will probably serve your day to day needs very well. A set of four dishes will let you get away with not doing dishes for a few days. If you have a small family, you may want to get a slightly larger set, and if you have extended family living or eating with your regularly, you’d do best to look for the largest available sets. The catering set we looked into, for example, might be a good choice. Dinner parties are fun and a very popular way to get to know colleagues, partners, friends, and family members. Matching sets of plates are important for these events in most circles, and your plates will make a statement about your lifestyle, budget, and social standing. Serving dinner on melamine plates might be acceptable if you’re eating outside, or if you’re serving an informal, buffet-style meal. Usually, however, guests expect ceramic, glass, stoneware, or even porcelain plates. If you only plan on inviting two or three people at a time, a small set of dishes would be perfect. A set of six would allow three couples to enjoy a wonderful night in. If you want to entertain a larger group, it’s a good idea to get a few more plates than you think you’ll need, because accidents do happen. Q: Do I need my full plate set to match? This question is a matter of personal preference vs. social standards. Unless you’re entertaining high brow business owners in your home, you probably don’t need everything to match. You may enjoy the ease of a matching plate set, however. 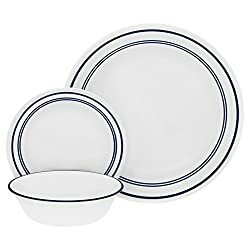 If your dinner plates, dessert plates, bowls, cups, and salad plates all match, then it’s pretty easy to set the table. Lots of people enjoy some diversity on their tables, though. You may have intricate plates, but simple glasses. Some brands, like Rachel Ray, design their products to be mixed and matched. This works particularly well for solid colors, of course, but it’s possible to introduce some patterns if you so desire. In short, very few social situations require perfectly matched dinnerware. It may be easier for you, or you may prefer a more colorful table. Either way, it’s your table, and it’s your decision. Ultimately, it’s the quality of the dinnerware that matters. Everything else is an expression of your tastes and lifestyle.